I couldn't find a pic of my tree yesterday but I looked a little harder and found this one. 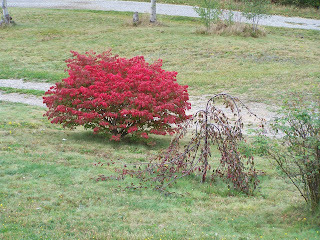 The tree from yesterday's post is in the middle, next to the bright red one. Small isn't it? Thanks for posting the pic. You'll have to go back and take pictures each year and keep us updated. Did you tell the new owners that they can't touch your tree? LOL.